To record a video interview or start a video chat face to face isn’t a big deal even if the participants are located miles away from each other. But to organize a video conference for a group of 5, 10 or 12 people or hold a webinar can become a real challenge. No matter what your goal is, you’ll need a good group video calling tool. Have a look at top 5 free video chat programs we picked out for you. Platforms: for making video calls – Windows, Mac, Xbox One; for listening – Linux, iOS, Android, Windows Phone, BlackBerry, Amazon Fire, Smart TV, PlayStation Vita. With Skype you can enjoy group voice calls with up to 25 people and video calls with up to 10 people. No premium account needed. Still if you own a Business subscription, you may start a video conference with 250 participants. Pricing for Business starts from $2 per user monthly. 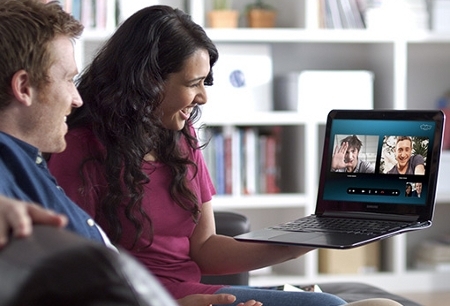 Skype recommends video group calls with up to 5 people, since it complies with their fair usage policy. Group video calls are limited to 100 hours per month with no more than 10 hours per day and 4 hours per individual video call. Once these limits have been reached, the video will switch off and you’ll be turned to an audio call. You can’t start a group video call in Skype for mobile devices, Linux, and TVs. However, you take part in it with audio only. DirectX 9.0c compatible video card on Windows OS. Make a group of all the participants of your video call or just hold Ctrl and click the contacts from your list you want to call. Click the Video call button. At the end of the call, click the End call button. When you make a video call, Skype automatically determines the quality of video call that your system is capable of supporting. In case you have any issues with group video calls in Skype, see this troubleshooting guide. While having a group video call, you may start a screen demonstration for all your participants, send files and contacts, and add other members to the conference. Platforms: Windows, Mac, Linux, iOS, Android. 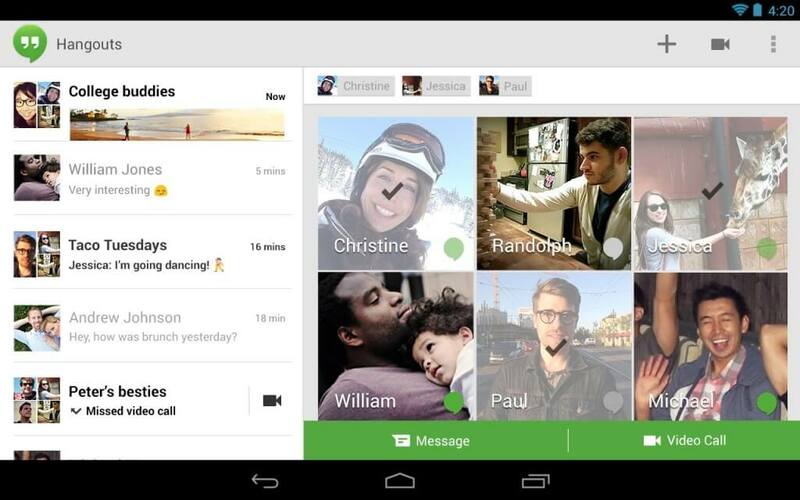 Google Hangouts is the easiest video chat option for up to 10 people since it’s totally web-based. If you have a Google account, you may start and join from your computer, smartphone or tablet. Log in into Google Plus or Gmail. If you’re using Internet Explorer, Firefox, Safari, you need the Hangouts plugin. In Chrome it’s automatically enabled. Open Hangouts at hangouts.google.com or in Gmail. Allow Hangouts to access your computer’s microphone and camera. In the search box, type a name or email address of each person you want to invite to your group video call and check the box in front of their names. If you have the right equipment, you can send and receive 720p HD video hangouts. You can send a permanent link to share via email or Google Plus, so that people could join your video hangout. To start a video hangout on an iOS or Android device, just intall the Google Hangouts app, pick up contacts and make video calls. You can also share screen with all video conference members, add new members, edit documents all together from Google Drive, play games and even broadcast your live video meeting to Google+ friends. 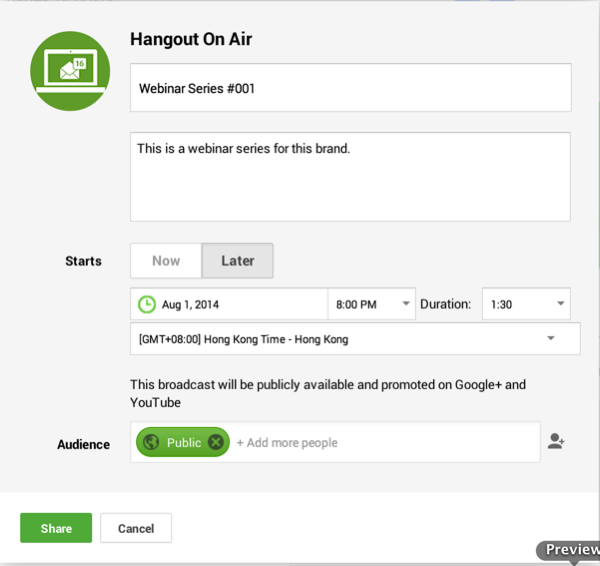 For a free webinar, you need to turn to the Hangout on Air option. Don’t worry about the number of attendees, as it’s all free but ad-supported. 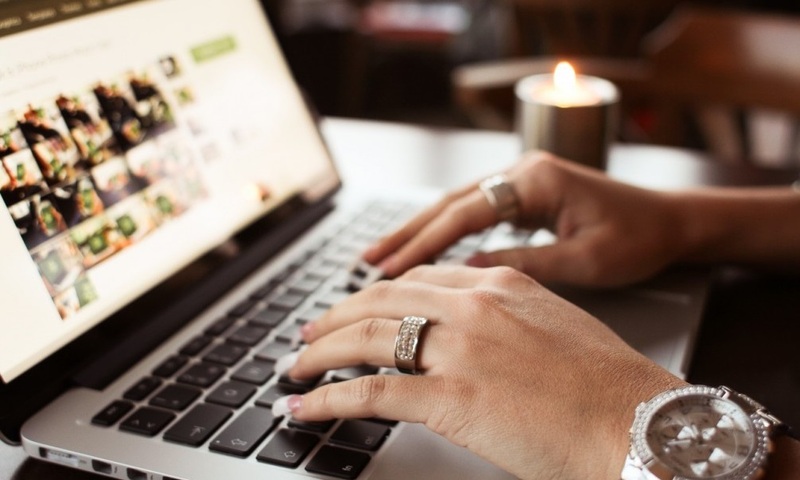 Add all of the details of your webinar: title, the details of the webinar, and select if the webinar will be broadcasted Now or Later. Finally, you can choose to make your webinar public or exclusive to a specific audience or circle. When you’re done, click the green Share button to create your webinar. After the webinar is finished, you can send it to YouTube. 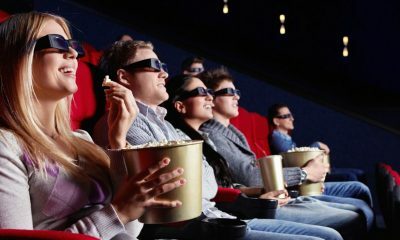 If you want to save a copy on your PC, just convert this online FLV video to MP4 using the step-by-step guide. 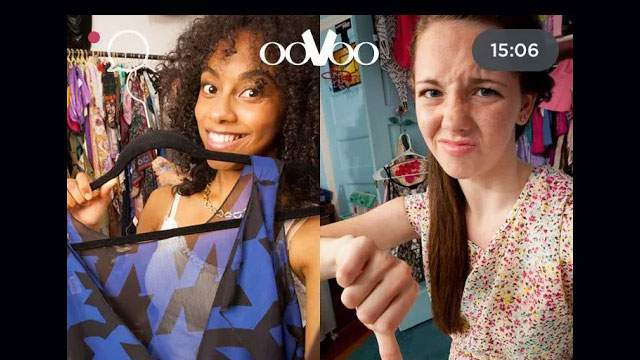 ooVoo offers group video call to up to 12 people. This is free unless you want to remove ads, sync your ooVoo apps between desktop and mobile or have cloud video storage space. The premium account costs $29.99 per year. Register an account or connect with Facebook (ooVoo users are required to be 13 years old). Select users from your contact list with which you want to launch a video chat. Click the Video Call button to start a video conversation (or simply double-click on the contact). While video chatting, you can also record your video conversation or watch YouTube videos together. AnyMeeting lets you share up to six webcams at once. 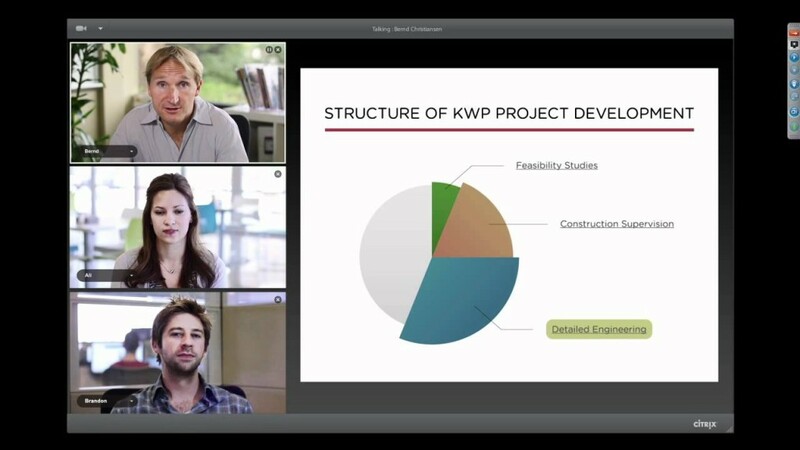 The video quality automatically resize to fill the available meeting space. No matter what devices the attendees are using, the video call will be working on all supported models. Go to the website and sign up. Download and install AnyMeeting app. Pick up contacts for your video call. Click the Webcam button on the upper panel to sttart video conference. While making a video call, you can share slides, play YouTube videos, run a poll, invite more people and take notes which will be further emailed to all other participants. 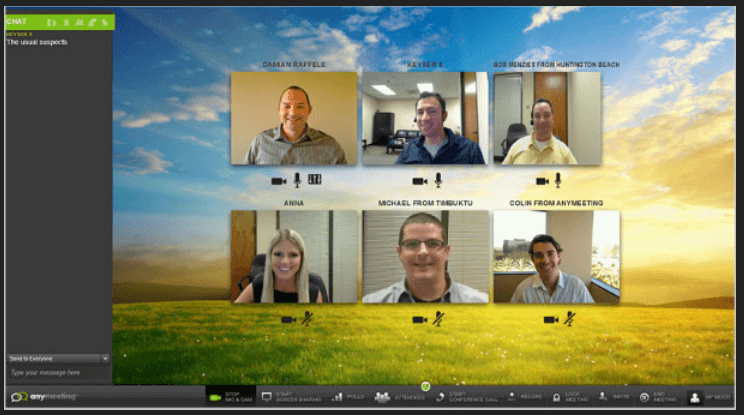 GoToMeeting is one of the most powerful chat tools for up to 100 people! However, only 6 people can broadcast their videos at a time. So even if you choose PRO paln with up to 25 participants, only 6 of them can share their webcams at once. It’s hard to find a suitable GoToMeeting alternative due to its irreplaceable features including support of video chat for any supported paltform users, screen sharing and powerful commenting options, video conference recording for further uploading to YouTube or a website. 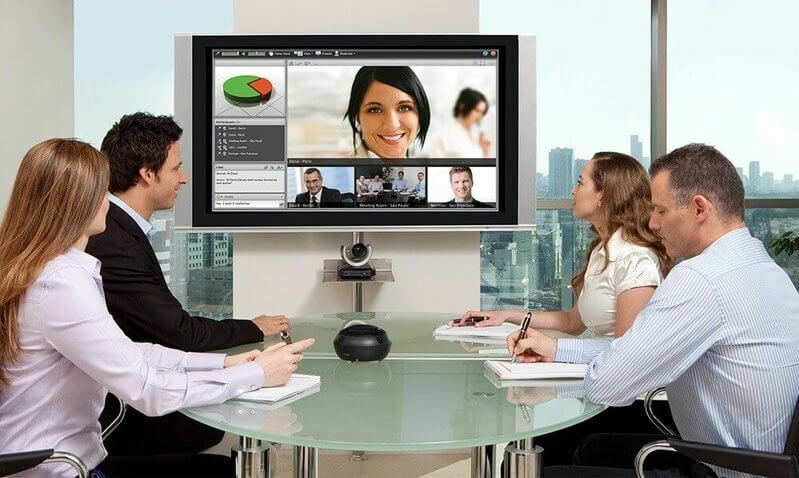 Get details how to use GotoMeeting for video conferencing and solve any problems with it here. We hope you find the best video chat solution for your goals. Share in the comments below which one you use.